Lil' Inker: Color Throwdown Wednesday!! Hiya! I'm here for this week's Color Throwdown Challenge! And BOY do I LOVE this week's colors!! Danielle is our hostess and she picked a rockin' set of colors for us this week! I have been WANTING the A Beary Good Year set from The Cat's Pajamas for some time now and I FINALLY treated myself! Yahoooo!!!! I just LOVE Pj the Bear so much. Here I embellished him with a scarf, hat and cup of coffee. After coloring PJ and accessories (paper piecing some parts) I hand cut my snow drift and embossed with a snowflake border. Then I stamped my kraft base with white polkadots, tied on an olive bow embellished with a button and some linen thread ALSO from TCP and can I just say that this is SERIOUSLY the BEST linen thread I have EVER worked with. You MUST own some! And even better is comes in two colors! LOVE!!! That's pretty much all there is to it gals! It's pretty clean and simple and came together relatively quickly which doesn't happen often for me so YAY! You've got to head on over to the CTD blog where you can read all about playing along with us. AND you've got to check out the blogs of my fellow designers where they have their delicious projects posted for your inspiration. AND, while it was a blast working with Amy Sheffer last month it's time to welcome a brand new guest designer for November, Lydia Fielder! I can't wait to see your creations using this week's colors. This is awesome, Laura! Love all the different textures. Your little bear is absolutely adorable, Laura, and I love how you created the snow....super cute!!!! Laura, this bear is so cute and he's colored in perfectly. Love the rolling hills, too! Cute! That bear is just adorable! I love the embossed snow panel and the snowy polka dots! Super cute! He really is a most adorable bear! Love the curvy, textured panel and the clean, simple design! How adorable! Your coloring and paper piecing on this cute image looks fantastic and I love the snowy back ground! I'm so glad you got that little bear so you could make this awesome card! Love how you colored him and placed him on the snowy hillside with his Starbucks! Totally adorable, Laura!! Love your snowy hillside and awesome coloring! Laura, this is just too cute! 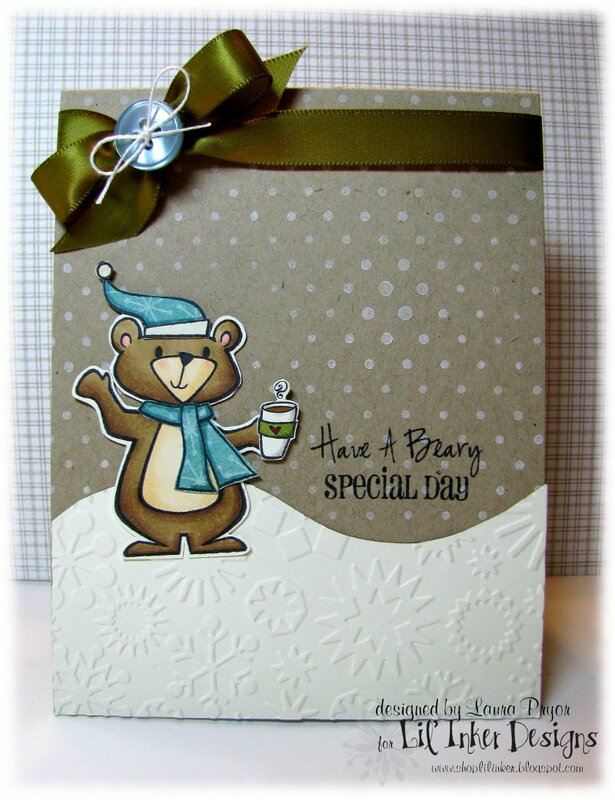 Love your snowy scene with PJ the bear! Freakin' A-DOR-ABLE, Laura! I LOVE P.J. standing there on that big snow drift, and your fabulous CAS design! LOVE this Laura!!! GORGEOUS coloring and I LOVE the scene you created! I agree...TCP linen thread is the BOMB! !